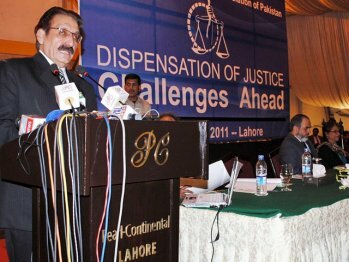 LAHORE – Economic and social inequality is growing especially because of corruption and is destabilising the society, Chief Justice of Pakistan Iftikhar Muhammad Chaudhry said on Saturday. Addressing a seminar titled, Dispensation of Justice – Challenges ahead’, organised by the Supreme Court Bar Association on Saturday, the CJP said the gap between the haves and the have-nots was constantly increasing, therefore, planners must devise safety networks for the poor and downtrodden sections of society. “According to the constitution, it is incumbent upon the state to reduce disparity in the income and earning of individuals,” he added. The CJP said the Supreme Court was striving hard to bridge the gap, ward off the evil of corruption and sustain good governance through better accountability and transparency. He said the Supreme Court had given verdicts on hundreds of cases of public importance in the last few years to uphold the rule of law. “In pursuance of orders of the court, billions of rupees have been recovered and deposited in the public exchequer in the Bank of Punjab, the rental power projects, National Insurance Company Limited cases,” he said. The CJP said after its restoration in March 2009, the judiciary took the foremost step of introducing judicial reforms to provide inexpensive and speedy justice to the people of Pakistan. “The National Judicial Policy was formulated in 2009, particularly with a view that constitutional principles of equality before law and equal protection of law were strictly enforced,” he added. He said courts had decided 3.1 million cases during the period but more than 2.6 million new cases were filed. The CJP said the Supreme Judicial Council, established under Article 209 of the constitution, was effectively considering and inquiring into received complaints. He said it was vital for improving the image of the bar that black sheep and those with stigma were targeted and dealt with under the law. He asked bar councils to enforce the code of conduct and professional ethics. “Currently, there are 192 complaints and 27 appeals pending against advocates of the Supreme Court of Pakistan in disciplinary committees, which require prompt processing and decision,” he added. He said the responsibility of the judiciary increases manifold in present circumstances to maintain a steady course and move forward in realizing state objectives of national stability, consolidation and peace. “It becomes incumbent upon the judiciary to stick to constitutional norms and ensure that other state organs and their functionaries also follow constitutional principles and abide by its dictates”, he added. He said the court needed to interpret the constitution and law in a manner that stability of the democratic system, political dispensation, economic development, peace and security were upheld and further strengthened.